Lykle de Vries | What about the ‘protected’ format of Pecha Kucha Nights? What about the ‘protected’ format of Pecha Kucha Nights? Mark Hoekstra (of Geektechnique fame), introduced Pecha Kucha Nights in Groningen (and The Netherlands) a long time ago. Since his unexpected and tragic death, I am proud to be part of a small crew that continues to organise Pecha Kucha Nights in Groningen, partly in his honour. 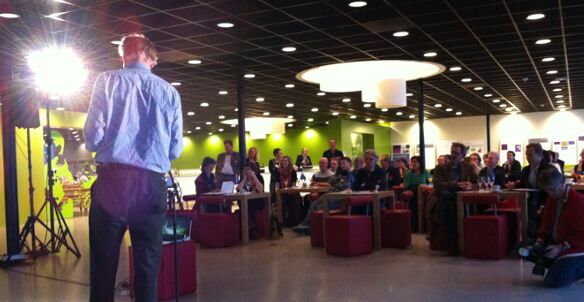 Last Monday, the fifteenth edition of a Groningen Pecha Kucha Night took place, in Leeuwarden. I was allowed a few words to kick off the event and share the idea and specifics of Pecha Kucha with the audience. Obviously, I mentioned the 20 slides, 20 seconds criteria, and I also referred to the fact that a license is part of the world of Pecha Kucha Nights. I was amazed by the response I received on that particular bit of information. Since the theme of this particular edition was “Social Innovation” (Dutch link), I anticipated enthusiastic comments regarding the fast pace and the easy way that Pecha Kucha allows a series of people to quickly present their projects and then interact directly in the breaks and afterwards. Instead, a few people came up to me and said that they objected to the fact that a license is required to put on a Pecha Kucha Nights. They claimed that that was old-fashioned, and couter to the open atmosphere and attitude that Pecha Kucha Nights promoted. I think they were projecting their own (old-fashioned) rules and expectations on a new way of sharing successful ideas. They associated ‘license’ with restriction, not ‘setting the stage for successful growth’. City organizers are really seen as stewards of the PechaKucha spirit, not owners! So the license acts as a token of your commitment and promise to do it ‘the Pecha Kucha’-way. It is called a ‘handshake’ for that reason. Do you think this is the best way to go about creating a uniform, globally recognizable event? Does utilizing a license appear counterintuitive in this day and age of open sharing.What are your pro’s and con’s? Let me know in the comments! | Leeuwarden License Pecha Kucha PechaKucha The New Event Industry What?